I could hardly let a summer pass without sharing some version of my favorite 3-ingredient marinade. This marinade has been quite popular with my family and friends for at least a decade now, and many readers have made it a regular on their menu rotations. The best part is, this flavorful marinade is as easy as it is delicious. 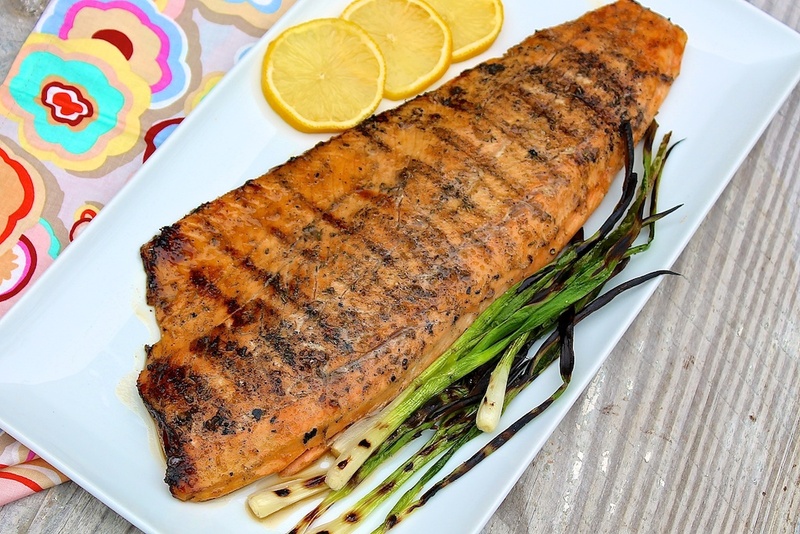 My sister-in-law, Melissa, originally suggested adding a hint of sesame oil when using this versatile marinade on heart-healthy salmon. Of course, this technically makes it a 4-ingredient marinade. Or you could simply call it Sesame Say Salmon. Whatever the name, this dish is still exceptionally easy and the Asian flavors compliment the salmon beautifully…and might even make a fan out of the non-fish-lovers in your family. For the history on this recipe and the 3-ingredient chicken and veggie version, click here. 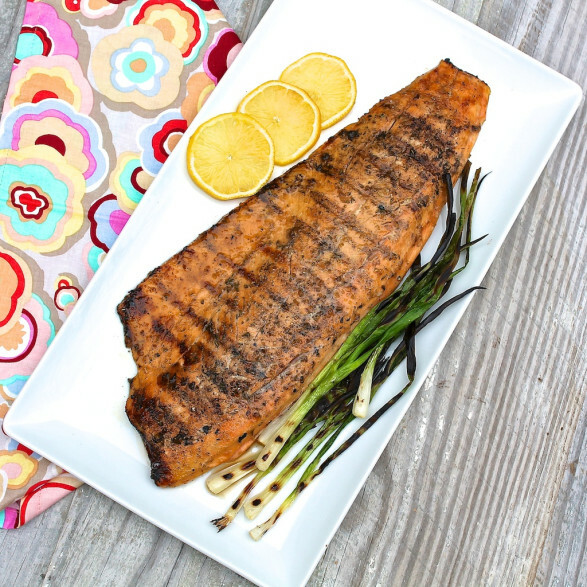 Dousing green onions or scallions with some of the marinade and grilling alongside the salmon makes for a delicious, quick-cooking accompaniment. Brushing the onions with a little olive oil and then sprinkling with salt and pepper is a good option, too. As a general guideline, one-third cup of marinade is enough for one pound of fish or meat if marinating in a zipper-top bag which allows the liquid to flow around the meat easily. The following quantity is sufficient for up to three pounds of salmon. If grilling less, you may adjust the amount of marinade to save on ingredients or use some of it to marinate your favorite veggies to grill alongside. Yields typical restaurant serving for salmon = 6 ounces. Mix the lemon juice, olive oil, soy sauce, and sesame oil together and place in a zipper-top bag along with the salmon. Allow the salmon to marinate for 30 minutes to 2 hours. This recipe is delicious without the sesame oil, too. If you don’t have any on hand, feel free to omit. We like to eat salmon just cooked through the middle, so I remove it from the grill when there is just the slightest bit of pinkish, translucent-looking meat in the center. As the salmon rests, it will continue to cook the remainder of the way through. If you are unsure as to whether it is done, cut into the center of the thickest part and take a peek. This will not effect the finished product at all. Absolutely delicious! If you like salmon, you have to make this. Can’t get any easier – so glad it is good for you too! Served with grilled potato slices and fresh local green beans. Great summer meal. Thank you for the terrific feedback, Gail. I’m thrilled it was a hit!